Saturday while showing some out of town friends the sites of Nashville, Ty and I set up his computer to secretly record the pug. Since moving to the new townhouse, I have suspected that Doug dances on the living room coffee table when I am away. Why? Because when I come home, the white lacquer finish is COVERED in paw prints... it's like straight up Blue's Clues! We were out of the house for about 3 hours, and around the 1 hour and 40 min mark, I got my confirmation. And it was funny. 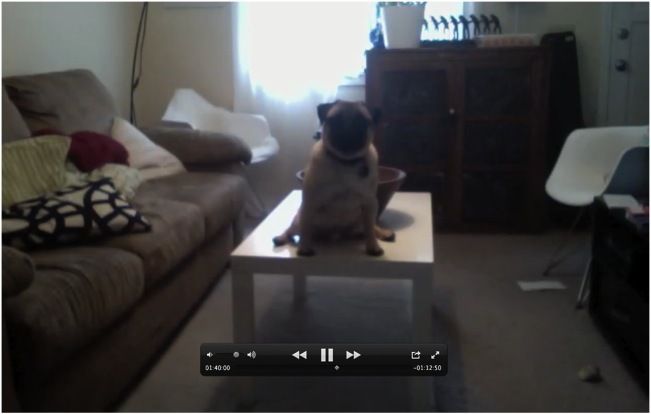 How awkward is that pug!? 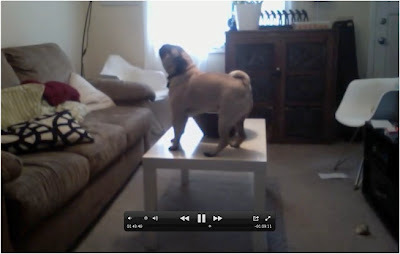 But then a few minutes later, he started howling/crying, and my ever loving pug heart shattered. I had always assumed that when we left the house, Doug somehow entertained himself with one of his BA-zillion toys or just slept the entire time. 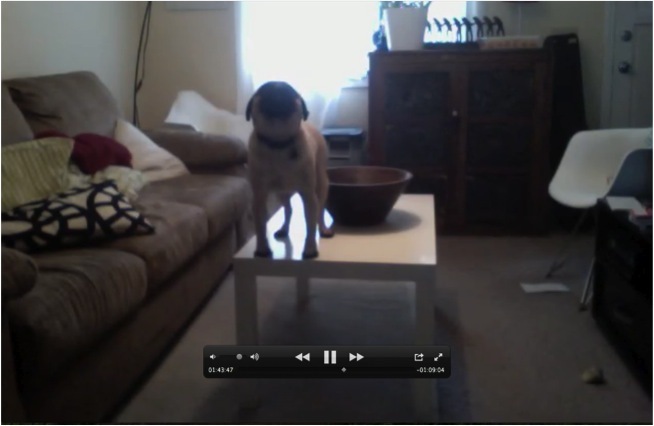 But now we know that instead, he jumps on the table, cries and stares at the door until we return. Saddest. Thing. Ever. Watch out Ty, my petition for a little pug brother for Doug has just returned to full force! How cute would he be with a little black fur brother!? The Yin & Yang of pugs! Do you know what your fur babies do when you leave the house? Awww, I would have just died, too! It's funny that the camps out on the table. When it was just Oscar and me, I'd crate him when I wasn't home and he seemed a lot happier and more secure that way. But then we gained Mike's two dogs, and they're good about entertaining and keeping one another company. You can use my testimonial if you need it. ;) Congrats on the Teen Vogue feature! Awww, poor thing! He definitely needs a friend! Oh my gosh!!! This is so cute yet so sad! I've often wondered what my pooch does when we're not home, though I haven't tried this. I just assume she lays in the sun (on the weekends she moves from room to room as the sun hits different windows, haha), chews on her favorite ladybug toy, barks at the people and dogs that walk by the house, and sleeps in our bed. But maybe I'm wrong?! Poor guy!! OMG can you please post this part of the video ha-ha! THAT is great! Aw... heartbreak!! I think another pug is a great idea!! Aw, such cute little fur buddies! haha! I hope you do... and let me know! Oh my gosh... this story is so much better/worse than Doug's secret footage! That video should be on YouTube! Haha, that is too funny!! I love that you caught it on video. But it's so sad that he misses you so much. I think he does need a little friend!! Our family dog mostly sleeps when we leave the house (he's really old now..), but when he does wake up and get off the couch, he stands at the window and whines and barks, which is really sad. I will have to figure out how to 1. post videos 2. speed it up 16X, there is a lot of sitting and staring! I like this testimony... and yes, sounds like your bf is so awesome! Thanks for the laugh! It is funny and awesome how much our pets love us. Lola has shown her love by tearing up many pairs of shoes and any nearby paper...I obviously never learn. I need a puppy cam! OMG. I laughed so hard at this story. I had to share it with my fiance too, because we've definitely set up a webcam to watch Zoey while we're gone. There's an iphone app that lets you do it, which is awesome, but she only sleeps! So boring! I like to think that she's throwing pug parties, though. Too cute. My dog like to get on the couch when we aren't and then acts like she wasn't on it. She can't fool us because the throw is normal on the floor when we get home . Talk about heart break! I'm thinking about getting my cat Ali another friend to play with - I feel like she must mope all the time when I'm gone too!